BPDE DNA Adduct ELISA | Cell Biolabs, Inc.
BPDE-DNA standards or unknown DNA samples are adsorbed onto a 96-well DNA high-binding plate. The BPDE-DNA adducts present in the sample or standard are probed with an Anti-BPDE-I Antibody, followed by an HRP Conjugated Secondary Antibody. 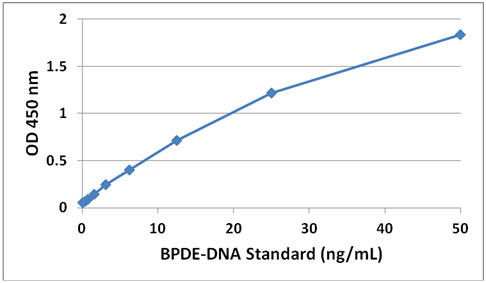 The BPDE-DNA adduct content in an unknown sample is determined by comparing with a standard curve that is prepared from predetermined BPDE-DNA standards. Figure 1: BPDE-DNA Standard Curve. Beranek, M. et al. (2016). Genetic polymorphisms in biotransformation enzymes for benzo [a] pyrene and related levels of benzo [a] pyrene-7, 8-diol-9, 10-epoxide-DNA adducts in Goeckerman therapy. Toxicol Lett. 255:47-51. Yang, J. et al. (2016). Ubiquitin protein ligase Ring2 is involved in S-phase checkpoint and DNA damage in cells exposed to benzo [a] pyrene. J Biochem Mol Toxicol. doi:10.1002/jbt.21811. Peters, R. E. et al. (2016). Do biomarkers of exposure and effect correlate with internal exposure to PAHs in swine?. Biomarkers. 5:1-9. Su, Y. et al. (2014). Interaction of benzo[a]pyrene with other risk factors in hepatocellular carcinoma: a case-control study in Xiamen, China. Ann Epidemiol. 24:98-103. Chiu, C. Y. et al. (2014). MOLECULAR TOXICOLOGY: Low-Dose Benzo(a)pyrene and Its Epoxide Metabolite Inhibit Myogenic Differentiation in Human Skeletal Muscle-Derived Progenitor Cells. Toxicol Sci. 10.1093/toxsci/kfu003.